Great Gatsby Themed Wedding! Sarah + Ed! I had a great time with Ed + Sarah at Wrigley Field for their engagement session a couple months ago…We all were so excited to see the Chicago Cubs clubhouse! Be sure to check out their Wrigley Field Engagement Session Photos! They assembled a great team of vendors for their Great Gatsby Themed wedding! Misha from Liven It Up Events was their day of coordinator, Vale of Enna provided the gold candelabras and ostrich feather centerpieces, and David Rothstein Music provided the live orchestra for the reception! 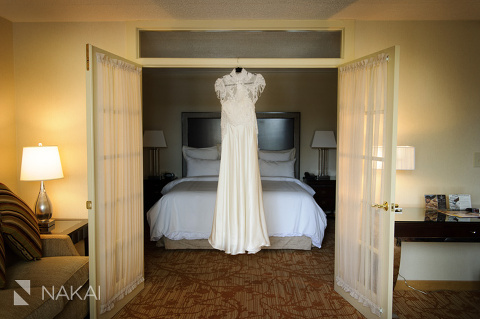 We spent their whole wedding day on the Lincolnshire Marriott Resort property…Her beautiful lace dress with some amazing details! The bridesmaids wore black dresses with the perfect pattern for their Great Gatsby themed wedding! Such a sweet photo with just the perfect amount of emotion! Beautiful wedding bouquet by Vale of Enna – white and pink peonies with vintage lace and a sparkling brooche! A photo of just the bride and groom =) Love the little pop of color provided by the yellow flowers! We had to include these two little guys in a couple pictures! The vintage train car is looks really cool in a nature setting. Love this pose by Sarah and it highlights her dress just perfectly! Vale of Enna did a phenomenal job of turning Sarah + Ed’s ‘Great Gatsby’ theme idea into reality! The white ostrich feathers and the gold candelabras are amazing! Their wedding programs also had a Great Gatsby vibe by incorporating an art deco design! After the wedding ceremony was over, Sarah + Ed had a traditional Korean ceremony called a Paebaek. My favorite part of the Paebaek ceremony: when the groom has to run around the room with his bride on his back! Go Ed Go! Art deco menu to complete the Great Gatsby theme! David Rothstein Music took to the dance floor to get people singing! Thanks to Sarah + Ed for having me as your wedding photographer! I loved all the Great Gatsby wedding details! It was also great working with a great team of vendors! Shout outs to Misha from Liven It Up Events, Vale of Enna , David Rothstein Music and the Lincolnshire Marriott! I’m so thankful to have spent time with the two of you and your wonderful families! « JW Marriott + St Michael’s in Old Town! Lindsey + Jordan!